If you’re struggling with coming up with ideas for your plot, take a closer look at your characters. 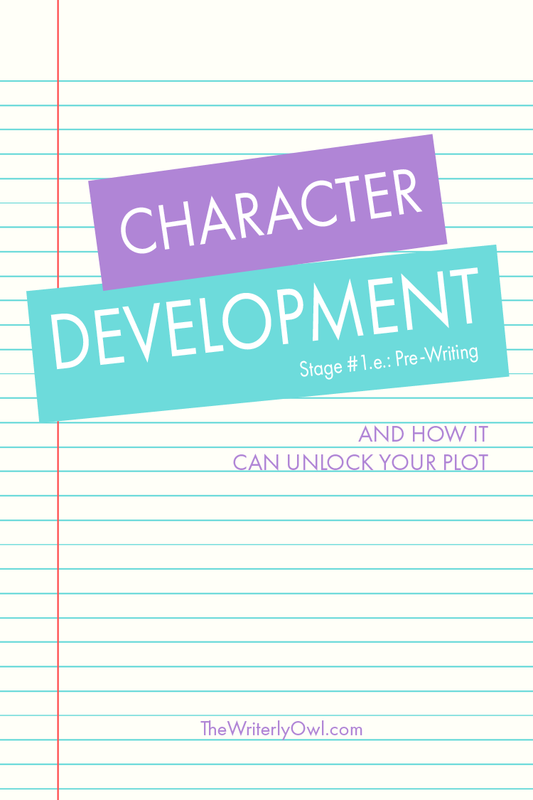 With an intimate knowledge of your characters, you can unlock doors in your plot. Another advantage of character development —it will help you write scenes that are relevant to both your characters and the overall plot. Each should carry some weight in your character’s fate and serve a purpose more important than a grand spectacle. Not to say a massive car chase through the desert with aliens on your character’s trail isn’t great, but what you have to ask yourself is — how does this chase play into the strengths, weaknesses, and fears of my character(s)? How they respond to and tackle the situation should demonstrate the kind of person they are. You have to know who you are writing about to know what to write. In today’s article, I’ll go through six areas of character development you can tackle for additional plot ideas. Don’t use a laundry list of descriptions for your characters. Instead, focus on a few unique physical attributes. Key features you want my readers to bear in mind as you allow them room to use their imagination to fill in other details. Take for instance Dumbledore’s half-moon glasses in Harry Potter, Snape’s greasy hair or Professor Trelawney’s bug eyes magnified by her glasses. These were key descriptions that set each of the characters apart and set memorable reference points that worked as well as their given names. In the Throne of Glass series by Sarah J. Maas, what do you remember right off the bat about Rowan Whitethorn ’s appearance? For me, it's his tattoo, the markings of his past along the side of his face and his arm. Not only does Maas use this as a landmark description, but it also gave her unique leverage into exploring his burdened past. The mere fact that he chose to mark his skin with tales of the people he has lost speaks to the impact the events had on him. The lasting effects of which shaped how he lived and loved in the present. Even without mentioning the details of his tragic past repeatedly, the tattoo stands as a reminder it exists, keeping his pain at the fore of your mind. Most of us hold on to items in our lives that possess sentimental or superstitious value. These items, when included in your story, can come in handy to shake-up your characters. Emotional turmoil: Imagine losing a locket from your grandma or a bracelet from a close friend, both of whom passed away. Perhaps you’ve been in a similar situation. Think back to how you felt and how it affected you. Integrate a similar scenario for emotional impact in your story. Growth and healing: Link an item to a painful point in your character’s life they need to get passed to reach their higher self and accomplish their goals. The act of them giving up this item, or a change in how they react to it can symbolise their growth and healing. #3: What is your character’s weapon of choice? We all arm ourselves in life whether with physical weapons, our charms, or our wits. Knowing your character’s weapon of choice tells you how they navigate their world. Do they value brute force over cleverness? Are they passive and use no weapons at all? Do they walk through life as prey, predator or neutral entity (not a bully but not bullied either)? You can also use it to create scenarios that throw them off balance. What would your character do in a case where he can't shoot first when that has always been his method of solving a problem? And what would your bookish character do when she is faced with a physical challenge she can't "read" her way out of? Conflict can arise from a team that consists of the two above. Consider Hermione and Harry as they go on the run from the Death Eaters. Harry is more act first figure out the rest on the way, but Hermione likes to have all her moves thought out beforehand. Their clashing approaches caused tension and tested the boundaries of their friendship. Backstory provides the ‘why’ and ‘how’ of your story. Since you’ll be ideally starting in the middle of the action or close to when the action kicks off, your readers will have questions about how the misfortunes of your characters became an issue. But we’ve all heard the warnings about info dumping too much backstory. And we’ve all asked how much backstory is too much? Rule of thumb: Stick with the most significant events that have shaped my characters and events with a direct link to your plot. To determine the course of 'direct' events, begin with the end and work your way backwards. Think of it all lining up like a domino effect. Example: Event 4 was caused by Event 3, which developed as a consequence of Event 2 because Event 1 happened. If the event does not correlate with the main focus of your book, leave it out. Be critical. Think of the story, your character’s journey, and the bits of information your readers require to grasp the full context and follow along. Emotional wounds are painful experiences that hit us at our psychological core. This hurt is lasting and often shapes who we were as individuals. These kinds of wounds can be a powerful part of your character’s backstory. If this trauma happens at a young age, it can determine the truths your character adheres to as he grows older. On the other hand, if it happens to her as an adult, it could unravel all the truths she believed up until the point of the trauma. “…within each individual wound, there is a darkness that has the power to not only lock the character’s mind in the past so he can’t move forward but also embed an untruth that will sabotage his happiness and leave him feeling deeply unfilled.” Angela Ackerman, Emotional Wound Thesaurus. Emotional wounds lend to character flaws and fears, both of which you’ll need to create a well-rounded character. In addition, it opens the door for conflict between characters, affects the way they live and see life, and hinders them from forming stable, healthy relationships. See where I’m going? It unlocks drama galore. Exploring emotional wounds in an otherwise unlikable character is a golden strategy in evoking empathetic responses from readers. Villains and antagonists are products of situations and circumstances that have broken them in one way or the other. What's more frightening than an antagonist that reflects your deepest hurts and feelings? Cautionary tales of what would happen had you chosen their path of hate and vengeance rather than one of forgiveness and healing. The difference between the antagonist and the protagonist comes down to how either chooses to deal with their pain. Whether they heal or hurt others in return. Triggers that might aggravate the wound, etc. My two personality indexes of choice are the MBTI Personality Traits and the Hogwarts Houses. On some projects, I mixed the two. It may sound like a weird combination, but when you begin to dig deeper into both indexes, you’ll see places where the two overlap. The possibilities are limited only by your imagination. Each type of personality has its distinct combination of traits. They also have designated strengths, weaknesses, and stressors. During your character's journey, these four things (traits, strengths, weaknesses, and stressors) will determine how she behaves and reacts in differing situations. Example: In terms of stress, we all experience and deal with it differently. Whereas an ISFJ may become discouraged and depressed when faced with stress an ENFJ might disassociate herself from the stressor to preserve her peace of mind. With knowledge of your character's traits, strengths, weaknesses, and stressors, crafting situations meant to break them apart or test them becomes more natural. Clashing personalities breed conflict between characters while compatible personalities strengthen and establish bonds. By mixing the right personality traits, you can create chaos and harmony. Friendships and frenemies. What you want is a balanced cast, which will create a dynamic thread of inspiration you then lace into your story. Nothing beats a perfectly flawed character. These flaws or negative traits complicate your character's journey. As spill off of your characters emotional wounds and personality, they influence how your character lives her life and how she relates to others. Negative traits are sources of conflict and friction between characters of 'clashing' qualities. We all have someone who rubs us the wrong way, set up the same dynamic with your characters. Flaws create internal conflicts for your characters you can tackle and incorporate into your story to add depth. As they affect how your characters see the world, flaws are intangible obstacles blocking your characters from achieving their goals. Motivations drive action. Without them, we have no purpose, and without purpose we become stagnant. The same principle applies to your characters. There are two forms of motivations: internal and external. It’s the ‘lack of’ and ‘desire to attain’ that motivates your characters. Internal motivations: These occur within a character and cover psychological needs of self-actualisation, belonging and love, and self-esteem. While crafting your character motivations, determine, too, the reasons and follow through of your characters. 'Reasons' are the most distinctive differences between a Slytherin and a Gryffindor. Take Snape and Harry for instance. Harry risked his life for a noble and selfless cause to protect everyone. Snape also risked his life ‘to protect,’ but it’s not from what you would call a selfless and noble mindset. He didn’t risk his life because he developed an affection for Harry but because of his love for, Lily, Harry’s mother. It was his loss of the love of his life that prompted Snape becoming a double-agent for the Order. So the question is — had he not suffered this loss, would he have acted differently? Both are brave, but both are not selfless and noble. In this difference between Snape and Harry, J.K. Rowlings created a dynamic that bred relatable conflict, suspense, and an emotional connection with her readers. She highlighted a question we can relate to and one some would grapple with — who would you die for? Strangers with whom you have no emotional attachments? Or for the people you love? Neither question has a wrong answer, but both say something intrinsic about you. Rowlings demonstrated the values that characterised both characters, giving them roles that set them apart yet made them the same. Harry the hero, and Snape, the hero called a villain. What is your character lacking in her life? What’s making her unhappy and dissatisfied? What is the root cause of your character’s dissatisfaction? What obstacle(s) has your character encountered in filling the void? What changed in your character’s life to make the quest for desired need possible? Or the impetus that starts the process. What does your character’s motivation say about her? What values does she demonstrate and does it show her moral compass? Bear in mind motivations evolve. A character may start out wanting one thing, but as the story progresses and situations change, they’ll gain new knowledge and undergo changes. Their motivations will naturally adjust accordingly. To unlock the highest potential of your story, it’s essential you not only know "what you're writing about" but also "who you're writing about." Whether you'd classify your story as 'character-driven' or not, knowing your characters: what drives them, what they hold most dear, and what makes them unique and flawed, can offer insightful ideas for your plot's development. Sign up to my newsletter for access to the Owl Lounge and grab FREE resources for Character Development.